THE priest who publicly wished President Duterte would get sick might have been making the curse in jest. Still that raised the question whether one should do that against one’s enemy in politics or governance. Fr. Noel Gatchalian’s religion espouses goodwill even to one’s enemy. But apparently that has not deterred a number of priests from using prayer to strike down perceived enemies of the church and its precepts. Remember the “Team Patay” propaganda in a past election amid the reproductive health bill controversy? Some people might take the catchphrase literally. Fr. Noel is among the few who dared to wish publicly that the President would get sick. That must be due to the media coverage of the mass prompted by the Trillanes amnesty issue. Politicians are usually careful to keep private their wish of death or illness on their rivals. Cursing for heaven’s wrath to afflict one’s competitor is ill-mannered and not being a good sport and could cost votes. Unless you are Tomas Osmeña, the Cebu City mayor, who doesn’t hide his glee when a political foe gets sick or dies. Tomas offered a reason: his enemies had also been publicly wishing the mayor sickness or death. “Tunglo” or “tungo,” the word for it in Cebuano-Bisaya, gets into the trading of barbs in the heat of the campaign. As a cancer survivor, Tomas could boast that those who wished him dead had died ahead of him. 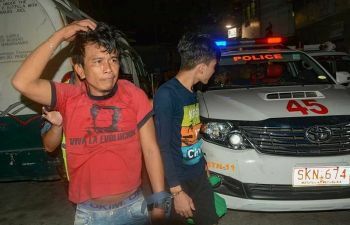 When George Rama, cousin and chief defender and attack person of then mayor Mike Rama, died on Jan. 26, 2016 and Ermita barangay captain Felicisimo Rupinta, Rama ally and rabid anti-Tomas, was shot in the head on Nov. 23, 2017, Mayor Osmeña did not deny he was happy. Wishing, however, for something bad happening to one’s political rival or being glad if it would happen does not mean he was responsible. Tomas was almost ecstatic about surviving two persons who had invoked “gaba” or karma against him but vigorously denied suggestions he had anything to do with their death. Homicidal thought is not punishable under the law, not until the thinker does an overt act to translate it into reality. Tomas couldn’t have caused “pneumonia sepsis” on George and most probably didn’t hire gunmen who pumped bullets into Imok. For decades, Cebu City political battles have not been tainted with violence. True, wishing the enemy sickness or death has not been taken off the field. But slew of rhetoric has not yet escalated into flow of blood, thank goodness. The past two years or so though, we have seen how impunity – the capacity to get away with murder – has increased in area and intensity. From the killings caused by the campaign against illegal drugs, it has spread to murders motivated by personal grudge, business rivalry or love triangle. Even executions not related to illegal drugs may have landed in the category of “deaths under investigation,” the quick route to the files on cold or, worse, closed cases. Fr. Gatchalian may have helped promote violence. If sickness or death of the enemy could be prayed for, inflicting the “punishment” under one’s instigation or order could tempt a politician who wouldn’t want to lose.